WINSTON-SALEM, N.C. – Chris Barclay tied his career-high with 163 yards rushing and two touchdowns Saturday to lead Wake Forest to a 45-17 victory over Clemson. Eric King returned an interception 85 yards for a touchdown and Jyles Tucker returned a fumble 12 yards for another score to help the Demon Deacons (5-4, 3-3 Atlantic Coast Conference) snap their four-game losing streak to Clemson (5-4, 3-3). Corey Randolph and Cornelius Birgs both scored on 1-yard touchdown runs and Matt Wisnosky kicked a 37-yard field goal as Wake Forest had its highest scoring output in 69 meetings with Clemson. The Tigers could not find a way to stop Wake Forest’s ground attack, which entered the game leading the ACC averaging 177 yards rushing a game. The Deacons had passed that mark before halftime behind Barclay, a sophomore, who had 159 yards at the break. They kept piling it up in the second half, reluctant to throw the ball with a 35-0 lead. Barclay only carried the ball two times in the second half before Randolph took over, adding 66 yards. Wake Forest finished with 321 yards rushing. Clemson, meanwhile, struggled offensively all day and didn’t get much help from quarterback Charlie Whitehurst, who was intercepted by King as the Tigers were driving for a first-half score and lost two of three fumbles. He finally got Clemson on the board with 13:11 to play when he directed a drive that led to Aaron Hunt’s 21-yard field goal that made it 45-3. Whitehurst finished 26-for-42 for 272 yards and three turnovers. He was benched midway through the fourth quarter when Chansi Stuckey replaced him. Stuckey threw an 11-yard touchdown pass Derrick Hamilton that cut it to 45-10 and a 5-yard TD pass to Kelvin Grant with 1:11 to play. He finished 9-for-15 for 71 yards and two touchdowns. He also ran for a team-high 35 yards. 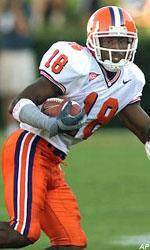 Kevin Youngblood had seven catches for 101 yards for Clemson. Wake Forest was aggressive from the start of the game, moving to the 5-yard line on its first possession before the drive stalled out. But instead of trying an easy field goal, the Deacons went for it on fourth down and scored on Barclay’s 5-yard run. The Deacons did the same thing on the next drive when faced with fourth-and-1 on the 1. Barclay again ran it in for a quick 14-0 Wake Forest lead. Whitehurst’s pass was intercepted by King on Clemson’s next possession for a 21-0 Wake lead. Wake Forest pretty much locked the game on its next drive, a 98-yard march highlighted by runs of 36- and 25-yards by Barclay.